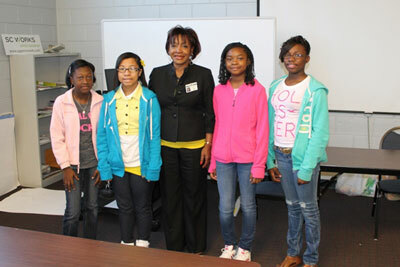 Middle School students from Abbeville, McCormick, Edgefield, and Greenwood are participating in a signature initiative of the Iota Upsilon Omega Chapter of Alpha Kappa Alpha Sorority, Inc. The Emerging Young Leaders (EYL) program emphasizes leadership development, civic engagement, enhanced academic preparation and character building. Participants attend a monthly workshop centered on the one of the four core program areas and attend community and social events to exhibit the skills they are learning. SC Representative Anne Parks and Greenwood City Councilwoman Betty Boles spoke with the participants about civic engagement. Parks explained what her responsibilities were as a state representative and how a bill becomes law. Parks also encouraged each participant to serve and to begin now preparing themselves for service by continuing their education and getting involved in the community. Boles spoke with the youth about the work of the city council, how issues are brought before council, and the agencies under the supervision of council. Boles also invited the participants to attend a council meeting to see the actual working of city council. Other programs presented have been on dressing for success, proper table etiquette and building relationships.